I have had many people inquire about how we set up our bassinet. Here is the answer. Brinley loved sleeping in the bassinet. She loved it so much, I took it off of its stand and put it in her crib so she could sleep in the bassinet. She slept in it until she was 5 months old. At that point, I had her take one nap a day in the crib, then two naps a day, then three naps a day, and finally added night. By about 5.5 months, she was in just the crib. 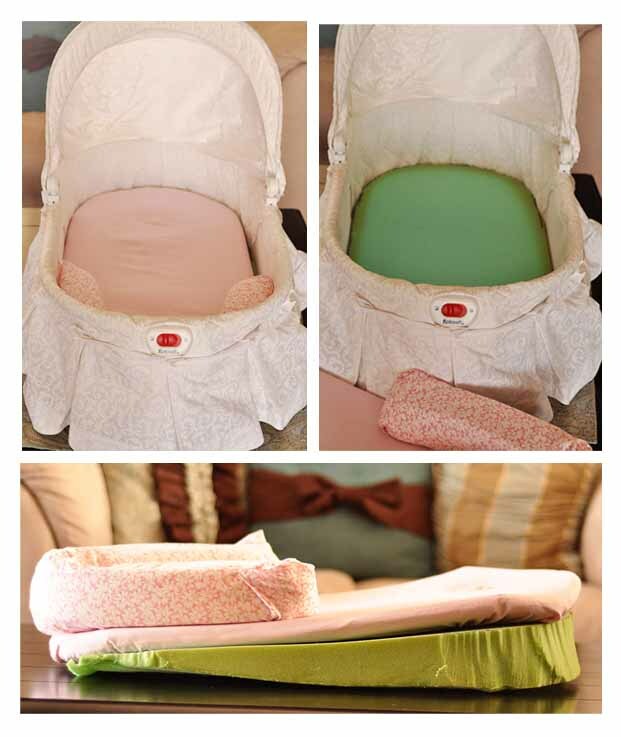 A great thing about a bassinet is that you can have it on an incline and keep baby in place much easier. I wish I would have thought of this when Kaitlyn was a baby. She had to sleep on an incline because of reflux and slid down the incline. We had the bassinet, set up exactly like this, in our room and she took at least one nap a day in it until she was 7 months old and finally just too big for it anymore. Something else people have done is put their SnuggleU with baby in the crib and they report it keeps baby in place. We had a SnuggleU at the time, but I never thought of that, either. I kept it in the bassinet at all times. There is nothing fancy about our bassinet. It is a Kolcraft, but we have had it for over 7 years. It is old. Amazon has a lot fancier Bassinets –some even have built in inclines that you can remove at some point. Those tend to be between 150-200. Simple ones that are more like the kind we have are more around 50-75. He traced the mattress on the foam pad and cut it out. He just used a kitchen knife–a cheap one. You can see the cutting is pretty rough. We have since found that automatic knives (like the kind people use to carve turkeys) make it much smoother and is easier. He then used a marker to draw an angle on the foam and then cut it so it was at an angle.The angle recommended for reflux babies is 30 degrees. We put that foam pad in the bassinet, then put the mattress on top that the bassinet came with. We then use a SnuggleU at the bottom. Brinley slept with the SnuggleU until she left the bassinet. She started in the crib with it, then I took it out. If you have a bassinet already or some foam (or access to inexpensive foam), this way is probably the best. If you are buying a bassinet, I would probably buy one. Nice to know we weren't the only ones who kept our babe in a bassinet for a long time. My son was in it for 4 months and then we put it in the crib for a few weeks. It made the transition so easy! oh gosh no you are not alone right now my 3 week old is in his bassinet sleeping. we inclined it as well we just used a soft blanket and folded it and put it at top under mattress and then we put two rolled up towels next to his sides and put a small gumbo under his feet so he wouldn't slide down. sounds like a mess but its what we did for all our kids and it worked. lol i need to try the foam just don't really have the money with 3 kids now. The conclusion I came to was it is okay if the baby prefers the bassinet. For brinley, I could take the bassinet off the base. I put that bassinet in her crib, so she was in her room in the right spot. Once she was ready to go out is the bassinet, it was rather simple. So my advice would be to put the bassinet in her room and then don't stress if she needs her bassinet longer than you expected. I moved her bassinet to sit inside her crib as well so she is at least in the spot she's going to be 🙂 Thanks for your advice!